You can buy these (cooked) in the Costco canteen and they are delicious. Be aware that they're huge and not exactly healthy! 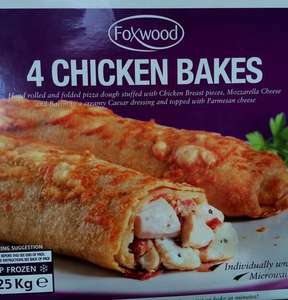 These are frozen to cook at home, currently £2 off making it £7.99 for a box of 4. I don't know why this deal is going cold unless the voters have never tasted one or think they may be the size of a spring roll which they aint !! at £2 each, i am expecting HUGE !! Perhaps that's a picture of a bulk pack containing multiple packs of 4 bakes? Cook in foil first. That’s the key. These are actually 1.25kg it’s just the picture has been cut short but like the others have said these are lovely. These are actually 1.25kg it’s just the picture has been cut short but l …These are actually 1.25kg it’s just the picture has been cut short but like the others have said these are lovely. Aww... You spoiled the illusion. I wish they were that size they are really nice. These are not the same ones as sold in their canteen - I asked. Yes they are very similar but definitely not the same, I also asked a few years ago and Costco confirmed they are different but nonetheless really tasty. The chicken meat smells in these. How on earth can ppl say these are nice. Look greasy from that picture. I’ll pass. I picked a pack of these up today from my local Costco and can confirm my earlier comment about them not being the same as the cafe supplied bakes but what I didn't know and actually seen happening today was the cafe bakes are hand made and filled / rolled up in the store by the cafe staff. I picked a pack of these up today from my local Costco and can confirm my …I picked a pack of these up today from my local Costco and can confirm my earlier comment about them not being the same as the cafe supplied bakes but what I didn't know and actually seen happening today was the cafe bakes are hand made and filled / rolled up in the store by the cafe staff. Bought some on the strength of the comments on here and yes they are very greasy n my kids were put of eating them due to the amount of grease dripping of them! I ate half n thought it tasted ok but i wouldnt repurchase. Baked in the oven wrapped in foil then uncovered as per instructions on the pack.